TVU cellular bonded systems have been a staple for Absolute Rentals since the early days of the TVU 8200. We have streamed hundreds of shows with the TVU 8200 and TVU One with fabulous success. TVU has not merely mastered the technology of live mobile broadcast but has done so by offering one of the most successful technical support teams in the industry. The TVU One represents a tremendous leap forward in professional live video streaming solutions. TVU One delivers high-definition picture quality with 0.5 second latency at 3Mbps within an ultra compact and rugged hardware design. It uses HEVC or H.265 compression standard to deliver greater efficiency in data use as well as increased transmission stability. 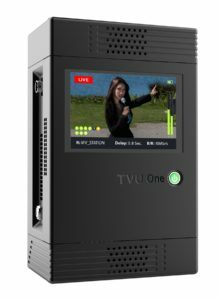 With TVU One, broadcasters of live video can fully leverage the versatility of a small, lightweight, IP-based high-definition video field transmitter without sacrificing performance, features or picture quality. Small Form Factor, Big Features – Despite its small size, TVU One is feature-rich with no compromises to performance or capabilities. To see a full list of hardware and software specifications for TVU One, view them here .